This publication is a useful resource for those traveling in areas where Q’eqchi’ is spoken or for anyone who wants to learn this Mayan language. This includes tourists and volunteers working in Q’eqchi’ communities. This book is also designed to be useful to speakers of Q’eqchi’ who want to work or study in English-speaking countries. The trilingual format in this book will also be useful for speakers of Q’eqchi’ in Belize who already speak English but who don’t speak Spanish and want to learn it. There is also a bilingual dictionary that include terms that travelers are likely to need to find. 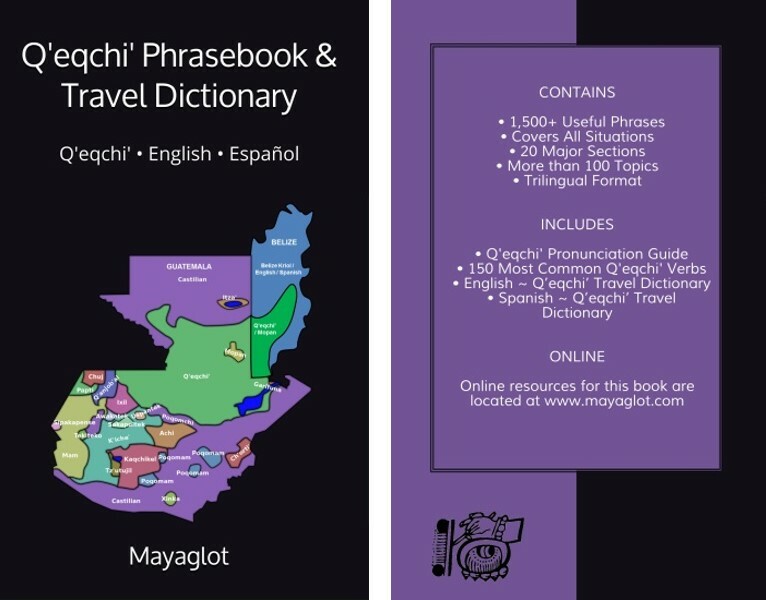 To buy a print copy of the Q’eqchi’ Phrasebook & Travel Dictionary, click here.